For Thanksgiving this year I made a Pumpkin Cheesecake that I absolutely loved. When the invitation for our annual Christmas Eve family get together came and the grandchildren were asked to bring a dessert, I knew I wanted to bring a cheesecake. Once again I went for a chocolate and peppermint combo which somehow never fails to impress me. This was delicious and another favorite of mine. Preheat oven to 350 degrees. Prepare a 9″ springform pan by adding aluminum foil around the bottom of the pan. Add the Oreo cookies to a food processor and blend until cookies become a fine crumb. Add melted butter and mix. Add cookie mix to spring form pan and press down to form a crust. Bake for 10 minutes then set aside. Reduce temperature to 325 degrees. Melt white chocolate in microwave. Start by placing chocolate in a microwave safe bowl and heating in 20 second intervals and mixing to melt. In a large bowl add cream cheese and beat until smooth. Add sugar and mix together well. Mix in the melted chocolate, flour, whipping cream, salt and peppermint extract. Add in one egg at a time, mixing until smooth and blended well. 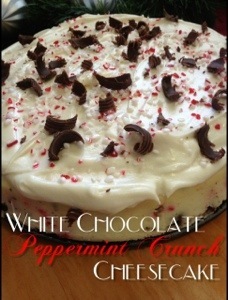 Fold in the peppermint crunch baking pieces and chocolate. Place the spring form pan in a roasting pan and add hot water to the pan. Add enough to cover about half way up the spring form pan, which should be shielded by the aluminum foil. Pour the cheesecake mixture over the crust in the springform pan. Carefully place the pan in the center of oven. Bake at 325 degrees for 1 hour. Turn off the oven and keep the door shut. Leave the cheesecake in the oven for an additional 30 minutes. Remove the springform pan from the oven and allow to sit for at least 1 hour before chilling. Place in the refrigerator and chill for four hours or overnight before adding the mousse. In a medium bowl, add softened cream cheese, melted white chocolate, cool whip, sugar and vanilla. Beat together until smooth and slightly thickened. Carefully remove the side of the springform pan. Spread the mousse mixture evenly over cheesecake. Add chocolate shavings and peppermint crunch to the top of the mousse. Chill for additional four hours or overnight before serving.